Music in church services is an important and featured part of worship. 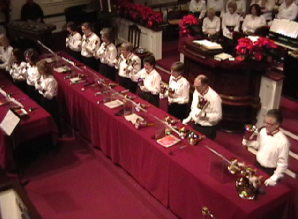 The church has a choir and the “Village Ringers” hand bell choir. Our choirs are open to all who enjoy singing or ringing high school age and older. Church membership is not required. The program year for Senior Choir is September to June. The bell choir has a shorter program year – September-December and February to May.The church choirs offer a Christmas Concert on the second Sunday of December. This annual event has become a treasured community event. The Senior Choir is the church’s adult choir. Singers from high school age up are welcome to join. The choir rehearses on Thursday nights from 7:30-9pm and Sunday morning from 9-9:40am for the 10am service. The choir sings one or two anthems per week. The choir sings a wide variety of music including classical and modern pieces. The Christmas Concert is a highlight of the season. Rehearsals for the concert begin in mid-October through early December. Our church started its hand bell choir in the 1970’s. The current bell choir has 13 members and the director. Membership doesn’t require experience or the ability to read music although a basic understanding of musical notation is very helpful. Each member usually plays two notes and the related sharps and flats. 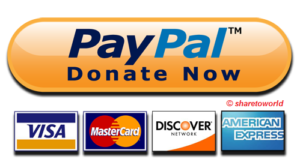 The repertoire includes a variety of styles. 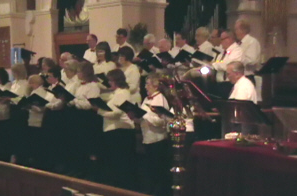 The choir performs at several services during the year and the Christmas Concert. For the past several years, the choir performs a “Ring in the Spring” concert in late April.